Starring Adjoa Andoh, Yasmin Bannerman, Anna Hope, James Dreyfus, and Julian Rhind-Tutt. 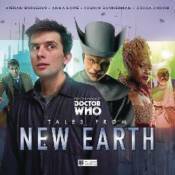 Four adventures from the New Earth setting of the television episodes "The End of the World," "New Earth," and "Gridlock." Five billion years in the future, after the end of the world in the year 5.5/apple/26: New Earth is the second hope of humankind. Senator Hame is working to restore her home. The cities, forests and skies teem with strange and wonderful species. Some trace their ancestry back to Old Earth, others came later, but all have their own agendas, and their rivalries.Now an ancient, powerful force has New Earth in its sights, and everyone must work together to beat it.